Last week my sister was up late one night, unable to sleep, and for some crazy reason she started going through old e-mail and forwarding it to me. And by old, I mean prehistoric. 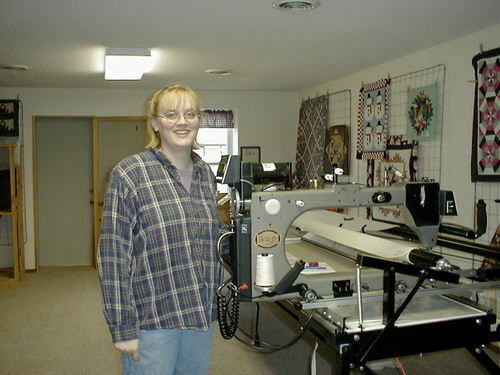 That picture was taken on December 4, 2001, the day my first quilting machine arrived. Where do I start? The hair? The glasses? The deer-in-the-headlight-look? 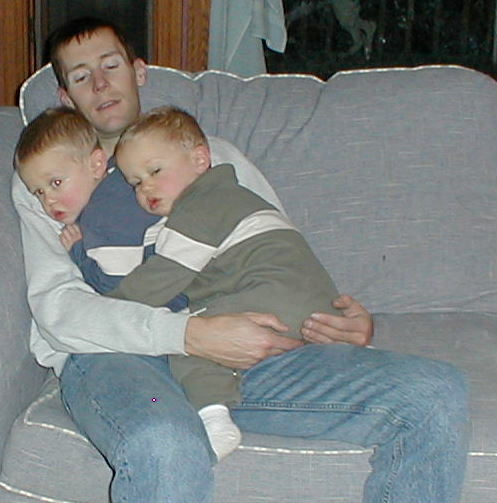 The other stuff she sent me was about the boys when they were really small — some really cute photos I had shared. What was really funny, though, was the e-mail I had sent (to my whole family!) about potty-training. I do NOT remember this, but Will would sit and say “two more squirts” and then and then after one squirt, he’d say “two more squirts” and keeps going like that…. (September 19, 2001). 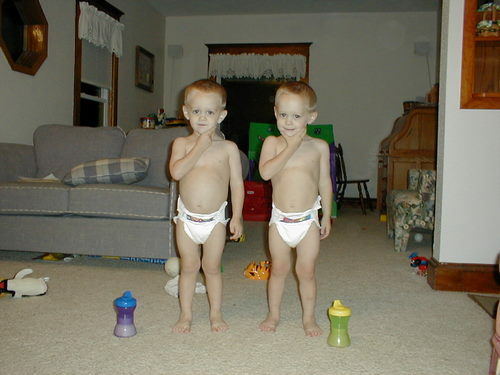 They were posing, saying “Hmmmm.” Don’t you want to just reach out and poke those bellies? I could get lost for hours looking at old pictures. As much as I enjoy playing with my pictures digitally, I need to spend some time actually printing some, I think the boys would enjoy paging through them, too. I’ll get on that tomorrow. That’s a really hot look you’ve got going there! I think it’s the shirt that pulls it all together. hah, v-dub took the words out my my mouth. That look is totally biteable. Hmmm. I think I still have that shirt, too. Toddler tummy is one of nature’s most perfect substances. I have two bellies just like those at my house you can come poke! Awwww! I just love the picture of Mark and the boys.